*Area, Population and Density rankings refer to Rutland Town’s relative position among Vermont’s 255 civic entities (9 cities, 242 towns, 4 gores and grants). Complete rankings are here. One of thirteen towns which Benning Wentworth granted during September 1761. 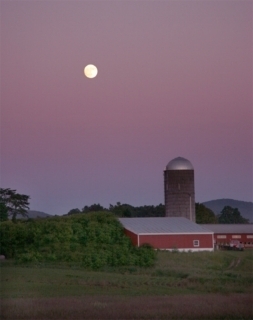 Seven of the thirteen are in Rutland County, but probably neither Wentworth nor the proprietors realized that Rutland town would prove to be the best of them all. The good farm land, which had interested the proprietors, was attractive to settlers, and the topography was favorable for highway and railroad building, so quite early the town got good transportation facilities. Marble was discovered in the area, just about the time the famed quarries of Carrara, Italy, became largely unworkable be cause of their extreme depth. 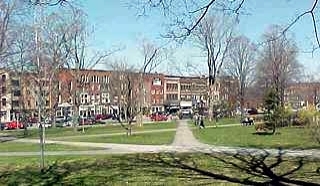 Rutland in Worcester County, Massachusetts, the home town of the first named grantee, John Murray (sometimes Murrey), is always given as the source for the Vermont town’s name. But, in addition, it is quite probable that Wentworth had a British peer in mind, as he often did. John Manners (1696-79), the third Duke of Rutland, in Horace Walpole’s words was “a gentleman of great worth and goodness” and “an ornament to the peerage of England.” He was descended from one of the great families of the Glorious Revolution, and held many positions of importance throughout his long life. He outlived his son, another John Manners (1721-70), who was styled Marquis of Granby and who was commander-in-chief of British armed forces in Europe during the last of the Seven Years War. The third Duke of Rutland had the honor of bearing the Queen’s scepter at the coronations of both George II and George III, the latter event having occurred the year before Wentworth granted Rutland. Rutland town grew very rapidly from 3,715 people in 1850 to 12,149 in 1880. During that period the marble business had boomed, but other spheres of endeavor also flourished. Various interest groups could see that there might be advantages to be gained by dividing the town. So, in 1886 several changes were made. About 4,000 acres were taken from Rutland and Pittsford to create the town of Proctor. Another new town was created by splitting off approximately 9,500 acres from the west side of Rutland, and named West Rutland. At the same time Proctor and West Rutland were created, the village of Rutland was incorporated to give it partly independent status. Six years later, in 1892, it was made a wholly independent city. After the division was accomplished, the town of Rutland was left with about half the acreage it had when it was chartered, and only a fraction of the population that it had in 1880. 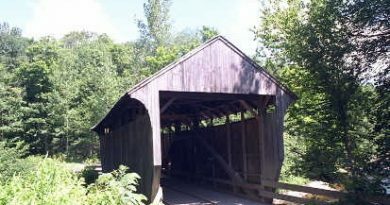 Click Here for a map of all bridges in Rutland County.